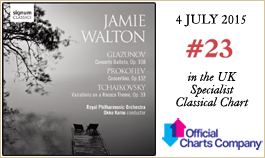 Becoming renowned for his purity of tone and uncompromising musical nature, Jamie Walton is now being compared by critics to some of the great ‘cellists of the past. He has appeared throughout much of Europe, the USA, New Zealand, Australia and the UK in some of the world’s most prestigious concert halls and festivals. He has also given regular appearances and broadcasts in chamber music, concertos and recitals in Vienna. During a recent antipodean tour of recitals and concertos broadcast on national radio and television Jamie was the first ‘cellist to give a solo recital in the new Melbourne Recital Centre. He and his pianist Daniel Grimwood appear regularly at Wigmore Hall and Symphony Hall, Birmingham where their debut was a recital of Chopin for the Chopin festival, sharing the evening with Krystian Zimerman. These led to concertos there with the English Symphony Orchestra and the Orchestra of the Welsh National Opera. They have also appeared in recital at the Bridgewater Hall, Fairfield Hall, Kings Place, Cadogan Hall and St John’s, Smith Square regularly as well as at the Chateauville Foundation, Virginia—a personal invite from Maestro Lorin Maazel. Jamie’s increasing discography is consistently receiving the highest critical acclaim and he is gaining a reputation as a supreme interpreter of the repertoire. Regularly voted CD of the month and given 5 stars by the likes of the Telegraph, the Times and BBC Music Magazine, the start of his concerto series with the Philharmonia (Saint-Saëns concertos) was voted onto Radio 3’s listening booth, going on to receive further ecstatic reviews—Classic FM magazine described his Saint-Saëns as ‘The finest around’. Developing a strong rapport in both performance and recording with this great orchestra, his Elgar and Myaskovsky disc was internationally praised, comparing Jamie to Rostropovich (International Record Review) and Tortelier. As part of an Anglo-Russian trilogy that is completed with this recording, in October 2008 Signum Classics also released Shostakovich Concerto No 2 and Britten’s Cello Symphony with the same forces. His recording career has also taken off with his pianist Daniel Grimwood; their recent Signum Classics release of the Rachmaninov and Grieg sonatas was Chamber Choice CD of the month in BBC Music Magazine. A JCL CD of Brahms, Strauss and Thuille added to the Romantic sonata series which is to be continued with Signum Classics releases of sonatas by Chopin and Saint-Saëns (No 2), a French disc of Vierne, Debussy and Poulenc as well as sonatas by Britten, Shostakovich, Prokofiev, Myaskovsky, Schumann and Janáček. Future recording projects include the Dvořák and Schumann concertos with the Philharmonia and to record/film the three solo suites by Britten as part of a box set to celebrate Britten’s complete works for ‘cello. As a member of the Worshipful Company of Musicians, he was recently elected into the Freedom of the City of London, having performed for HRH The Prince of Wales. 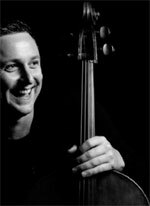 Passionate about chamber music and the landscape of North Yorkshire, Jamie launched the first North York Moors Chamber Music Festival in August 2009 to sell out audiences and is now an annual event having sold out in its second year.